There is no need to install the driver when using Cutting Master, or Graphtec Studio, Graphtec Pro Studio, as well as recent 3rd party software such as Onyx, FlexiSign, Caldera, etc. Windows driver installation is ONLY necessary to update firmware, to use the Graphtec Cutter Plotter Controller, or to run a plotter from a software program that requires it. This video will show you how to install a Windows driver, tips, potential issues, and solutions. Please view this video and try these suggestions before contacting technical support. When an error window pops up during the driver install on Windows 7 saying “operation has stopped”, it is caused by the operating system its self. Unfortunately, Graphtec Tech support can’t help with this issue as it is related to the operating system. SOLUTION: Take the most up to date driver found on our website and have a PC technician install it. In some instances, the end-user might not be aware that there are multiple security software programs running at the same time. These programs can cause issues while installing, or sometimes even downloading firmware. This video will show you how to find out what security software programs are running. At this point the installation is not complete, the cutter PC will not communicate until the driver installation is completed. Click >> Download 5-steps in pdf version (751 KB) Please have the driver files unzipped on the desktop before proceeding. If you see “USB Printing Support” under Unspecified (1) column in Devices and Printers, it means the driver was not installed properly. 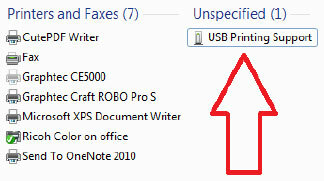 Right click on the USB Printing Support and select Properties.